I’m very glad you came to visit because I have some good news to share with you today. I am happy to announce that one of my Knittington Fairies designs has been licensed to be used as a header on the blog and e-shops of an amazing knitter. 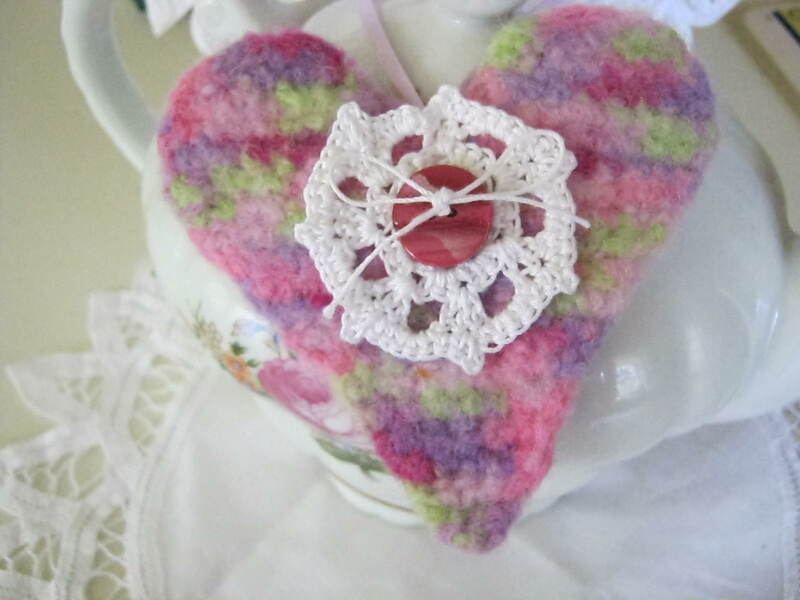 Christine lives in England, and her Wrapped in Colour blog and Etsy shop are so worth a peek. Here are some of her handiwork. I am taken with the yellow scarf. 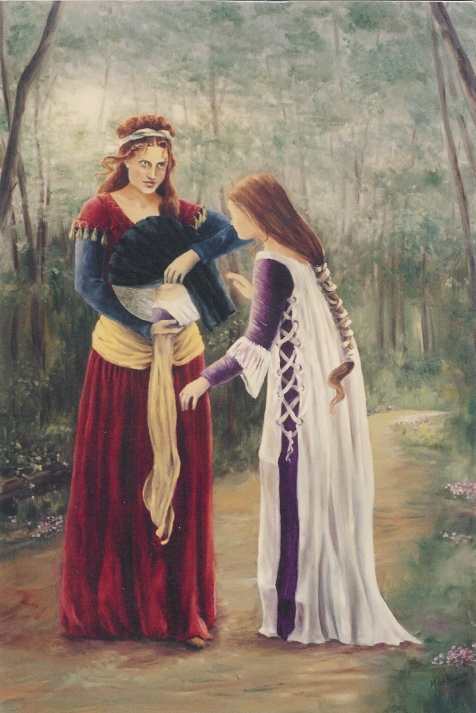 The patterns and colors of her work are lovely, and Christine’s talent is superb. 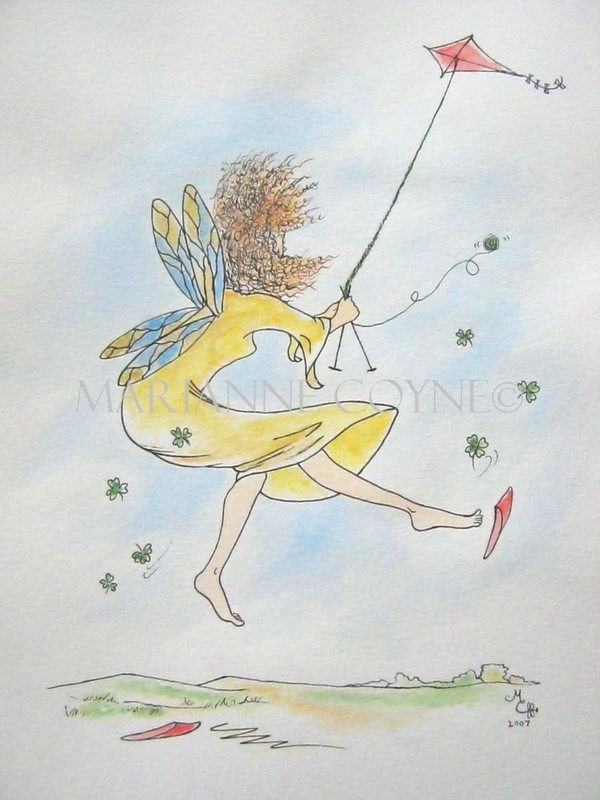 Drop by Wrapped in Colour and see the newest Knittington Fairies, and say hello to Christine. I’m joining Mosaic Monday’s host, Mary, at Little Red House A N D Handmade Thursday at White Lily Green. Thank you for strolling Leisure Lane. and until next time, may happy days abound! Ah May! The sweetest breath of Spring, when the garden resolves to give up its secrets, and the meadow releases its hidden treasures. Bloomalia’s greatest joy is to announce the arrival of May to all of Knittington, where the primroses are rosier, the daisies are sunnier, and the lilies are most fragrant. Bloomalia and her dear friend, Robin, delight in helping bring in this happy month to the season. 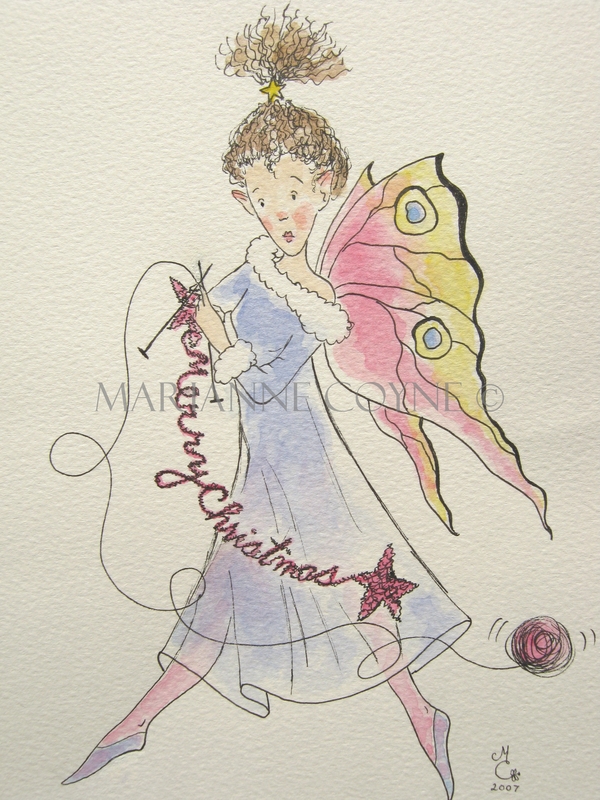 To see more Knittington Fairies stop by The Knittington Fairies’ Shop & Gallery. Everyone here on Leisure Lane thought the Royal Wedding was most beautiful and most royal…May God bless them with a most loving, happy union and family – Amen. 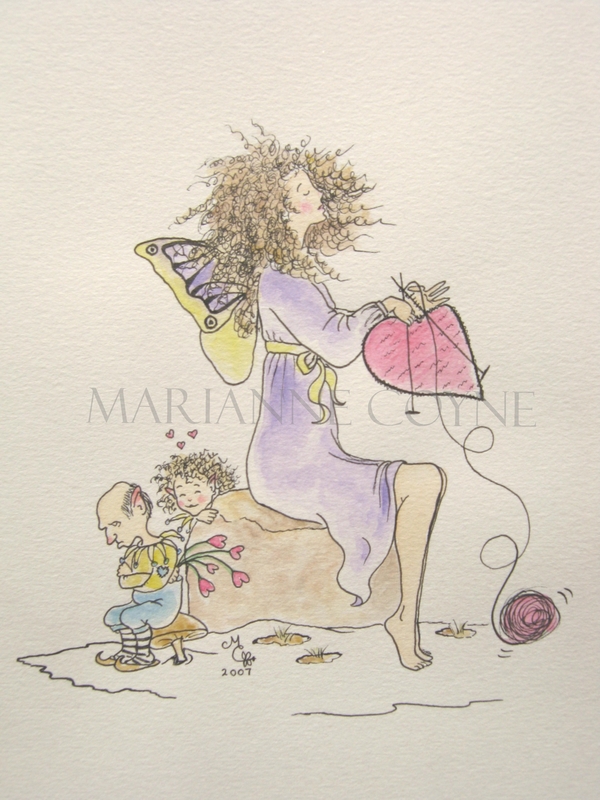 Above image is from an original watercolor in the series, The Knittington Fairies, by Marianne Coyne. HAPPY ♣ ST. ♣ PATRICK’S ♣ DAY ! 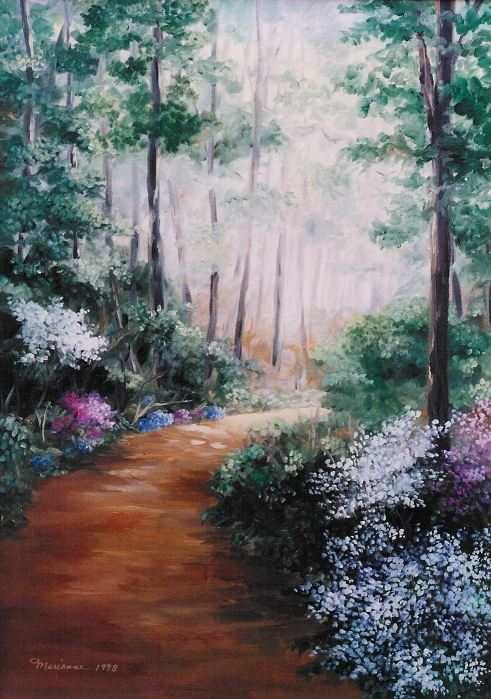 The blessing was very long, but so wonderful that, here on Leisure Lane, I will be posting another verse with each future post. I hope you glean some wonderful benefits from it. Have a Happy Day with a Pot O’ Gold on Top! 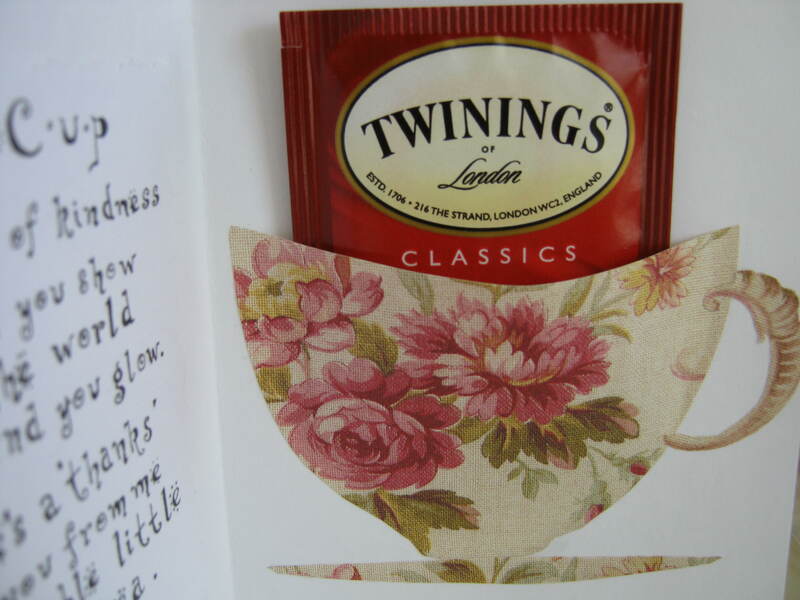 For next Teacup Tuesday, March 1st, I will be posting a tutorial for making a ‘cup of tea’ card similar to the one above. They make great surprise gifts to send to someone. It’s easy and fun to create, so don’t forget to stop by. I like to collect blank note cards because I can make them unique and personal. 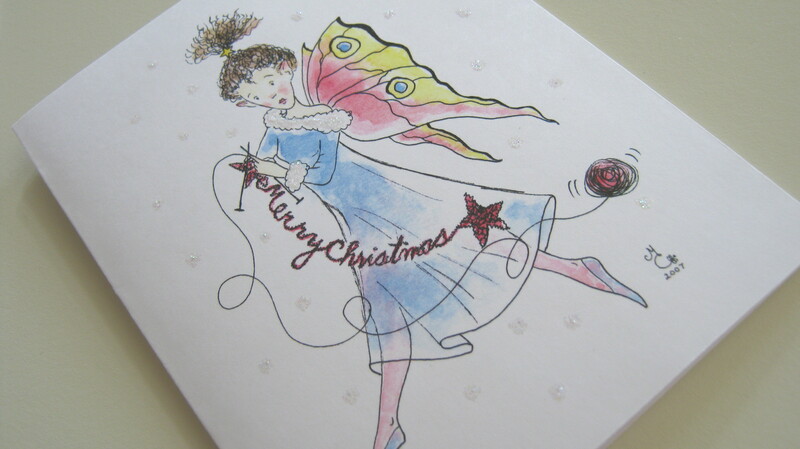 This one was made with one of my Knittington Fairy designs. Hope to see you then. I’m very happy you’ve decided to stop by for a visit. It’s a cloudy day today, but I’m hoping to at least get in some painting. Perhaps just some dabbling. Also, I have to decide which St. Valentine’s Day design I’m going to introduce to you. 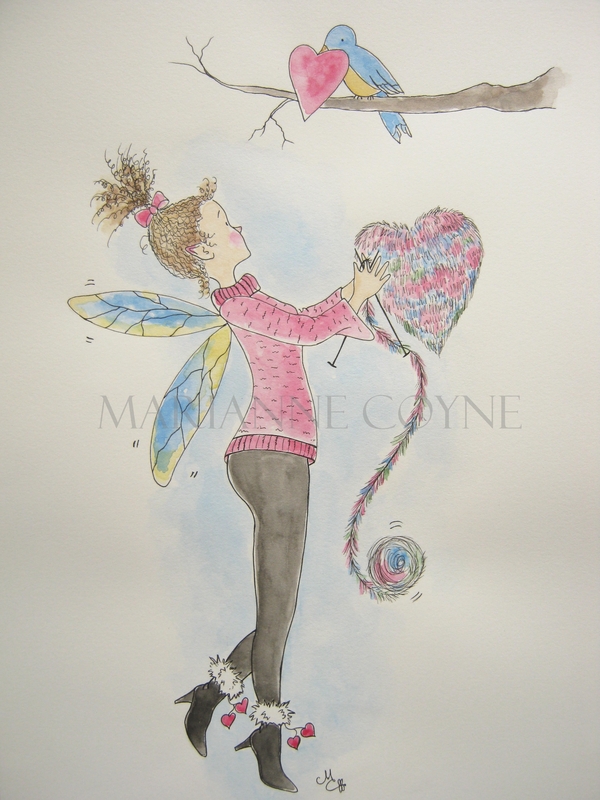 Perhaps you would like to help…here are two St. Valentine’s Day Knittington Fairy designs. Leave a comment to vote for the one you would like to see in card form. This could be fun. Just write the name of the fairy you’re voting for in your comment…the voting will extend until January 10th. We’re not quite sure what put our Eloise in such a tiff, but she’s determined not to give her heart away to just anyone. However our gnome friend mustn’t dismay ~ love is closer than he thinks. 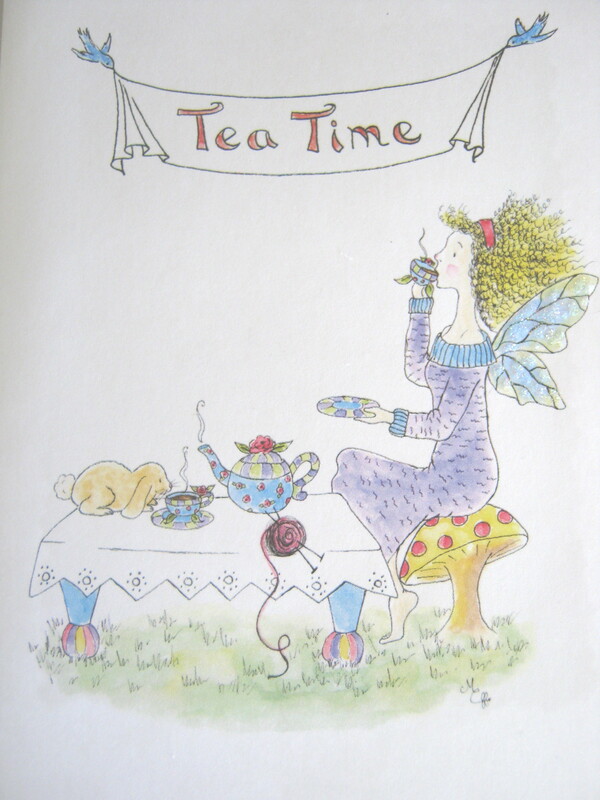 (Eloise was made for the 12 month Knittington Fairy calender I hope to someday soon see in production). There’s more to Francesca than her perky ponytail and cute ens amble. She’s ever quick to reciprocate a kindness, which only adds to her already “hip” demeanor. Knitting fun scarves and creating unique “you-can’t-find-this-anywhere-else” gifts for her friends is her favorite past time. 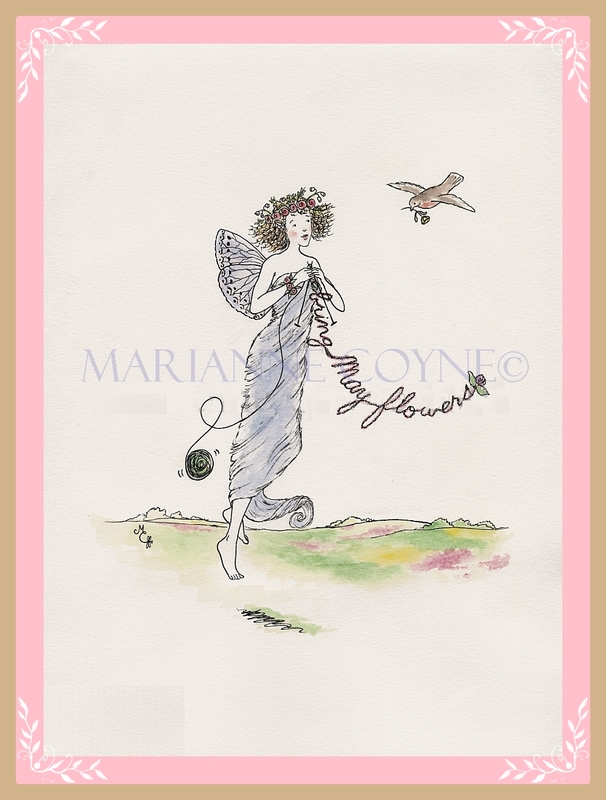 She encourages all the Knittington fairies to let their imaginations soar, and create ~ create ~ create! I’m also working on my next giveaway which should be around Valentine’s Day. I’d like to share with you a little bit about my journey with art. I’ve always loved anything that had to do with creating from the time I could hold a pencil in my hand. My earliest memories, I suppose, are from about 4 or 5 years old. I enjoyed Captain Kangaroo, and the little shoe box containing crayons, pencils, erasers, glue, string, paper, etc. he so happily employed in his show, I duplicated for myself. It was more of a treasure box for me….for me it might as well have contained rubies, amethysts, and sapphires. 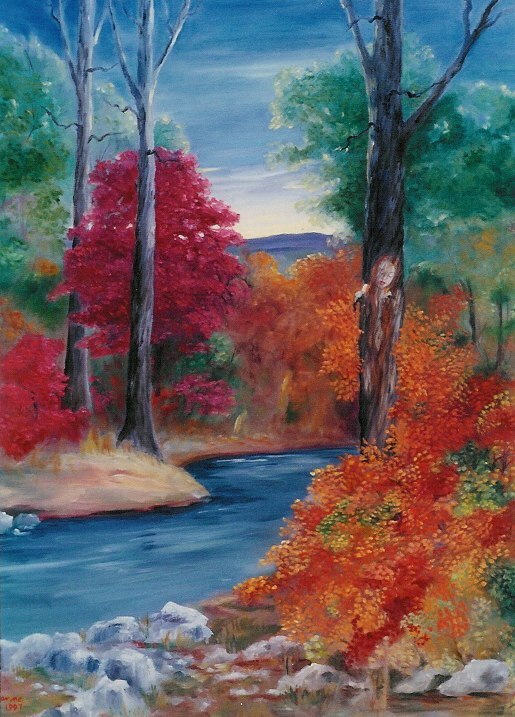 Although I did have a few lessons here and there, and managed to attain a BA in art, I consider myself self-taught in the field of art. Oils were my preference for painting since I was 12 years old, and Rembrandt was my real teacher and mentor for many years. 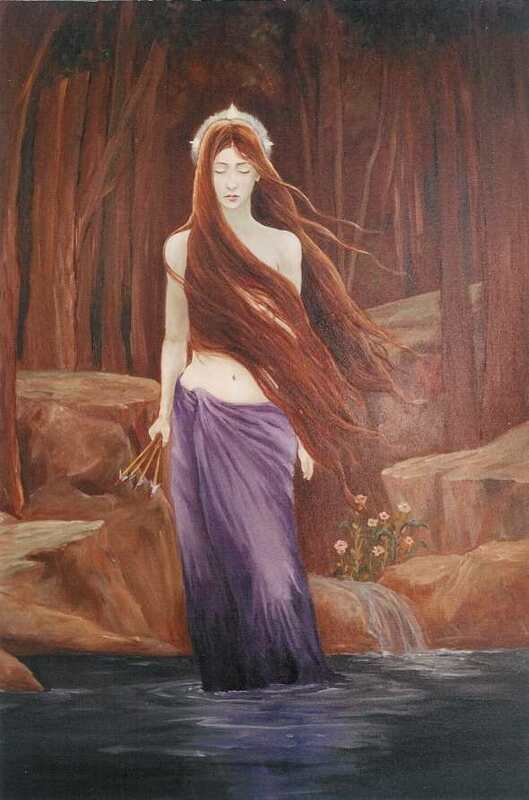 Then, as my work progressed and my subject matter evolved I became influenced by John Waterhouse and William Bouguereau. 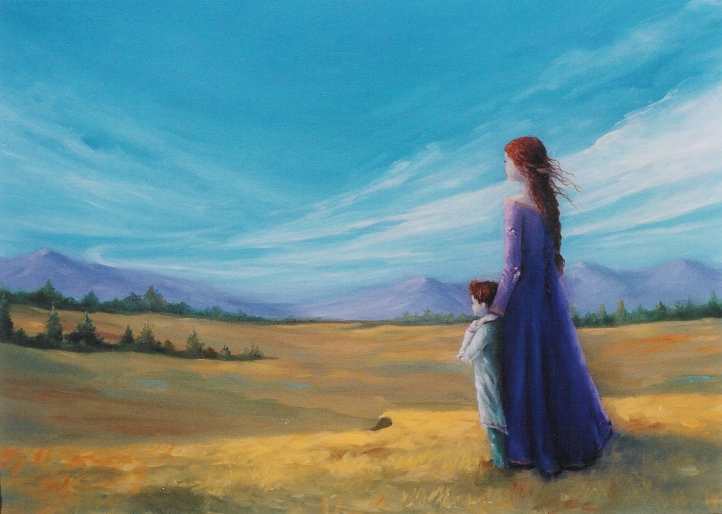 In 1996 I began a spiritual journey I will not soon forget, and my paintings reflected its results. Perhaps some of you can relate to that place of ‘going in’ where one finds yourself (who you are, what you are about)…Sue Monk Kidd so poignantly calls it cocooning…and in finding yourself, you find God; a glimpse of the Divine and your connection to It. I think the birth of my son in 1989 began this remarkable connection to the creation of God, but that’s another story. Many beautiful works came out of this search and Self-awareness. They are like way stations along my life’s journey, and I learned many things from them – patience, perseverance, endurance. But they were serious pieces expressing much emotion, passion, and expression, filled with illumination not only for myself, but for anyone who could find themselves within them. By 2004 my journey’s path began to clear, and by 2007 I found myself yearning to express myself in a lighter way. So I picked up the brush once again, but this time my chosen medium was also “lighter” – watercolors. 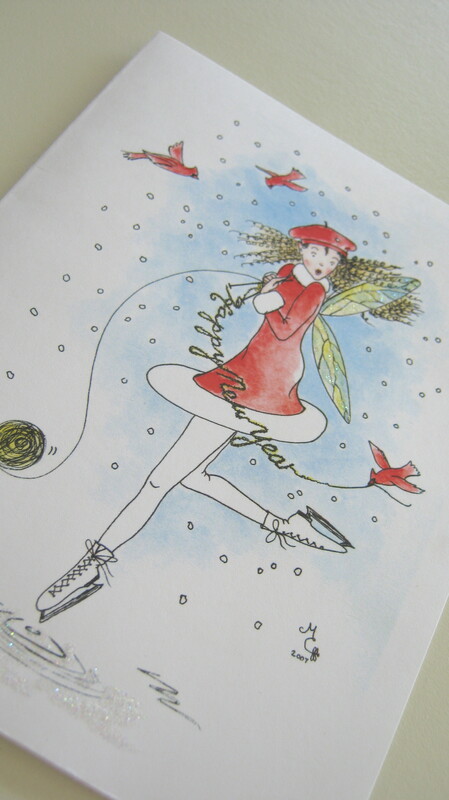 I began making fun, little pictures that I gave to friends, or used on hand made cards. They were brighter, more whimsical, and soon led to the Knittington Fairies series, as well as the Garden Sprites series (I haven’t posted these yet, but hopefully by summer they will emerge). I am in the process of expressing another side of myself; the whimsical, playful side. (Don’t you find that you have so many different sides to you, like the many facets on a beautifully cut diamond?) And I must say that I am having fun with it. Well, now you know a little more about how I got to Leisure Lane – a place I hope to showcase my work with the success that will enable me to create more, because that’s when I’m truly happy. And the more I create, the more inspiration can flow through me and out to others. It allows me to feel like I am using my gifts in the way in which they were intended to be used…giving joy, inspiration, and illumination to others. Thank you for visiting. I enjoy hearing from you, so feel free to leave a comment. Until next time, may happy days abound.